Maison Minatec, 3 Parvis Louis Néel, 38000 Grenoble, France. ​The annual SOI-focused conference also addressing advanced silicon-based technologies will be held in Grenoble, France, on April 1-4, 2019. This Conference will gather together all scientists and engineers working in the field of new materials and advanced nanoscale devices. One of the key objectives of the conference will be to promote collaboration and partnership between different academia, research and industry players.  CEA-Leti is an official partner of the event.